Nadal does it, Djokovic does it, Federer (on his day) does it better than anyone. So what is it? Well, the ability to get off to a quick start. We saw it today with Nadal against Wawrinka and Djokovic against Haas. Both should have been more competitive, after all Stan had played phenomenal tennis in coming back against Gasquet in the previous round. However, given he had a 0-9 head to head record against Nadal (now 0-10), I suspect he was always going to struggle mentally to generate enough confidence to compete. In whatever area, both in sport and business, don’t be like the club hacker and pitch up at the court, hit a few ground strokes, a few volleys, overheads and serves then, without a plan, try and work out how you’re going to win. Be more like the top players, they have already warmed up before they go on court, both having a hit earlier in the day and preparing mentally for the opponent they are about to meet. The very best, like Nadal, prepare rigorously, planning how they’re going to win before they even step on court. In “Winning Ugly”, Brad Gilbert covers this subject in the first chapter, ‘The Early Edge’, describing the time when he first emerged on to the tour and he was just doing exactly that, pitching up without a plan, until he learned. “it became obvious to me that for the best players in the world their match had begun a long time before the first serve. They came ready to play and wanted to grab me by the throat as soon as they could.” I’m not suggesting that Stan was like the club hacker, far from it – with his coach, Magnus Norman, they would have worked out a strategy for today’s encounter with Nadal. 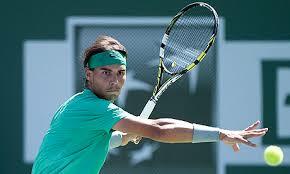 However, Nadal is better at preparing and then adapting when things don’t go his way. In this case he put so much pressure on Wawrinka in playing, as he put it in his post match interview, ‘his best match of the tournament so far’. So be prepared like Nadal and get off to a fast start. If it’s in a work context, make sure you know what you want from your day, or meeting and how you need to go about achieving it.